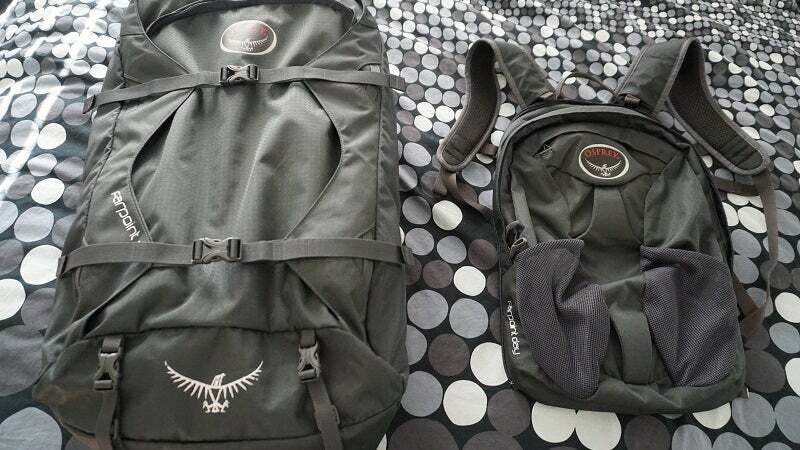 Osprey's Farpoint 55 backpack is really two bags in one. You get a large compartment to keep clothes and shoes in, plus a removable daypack that lightens your load once you set up base somewhere. Plus, the whole thing is small enough to count as a single carry-on bag. I recently went on a 10-day trek through Japan, and my Farpoint 55 by Osprey ($239.95) was the best pre-trip purchase I made. It only weighs 1.77kg, but overall it can hold up to 55L, or loads up to 23kg. I was able to pack three pairs of pants, six T-shirts, one dress shirt, six pairs of socks and underwear, a zip-up hoodie, a blazer, all of my toiletries and an extra pair of shoes in the main 40L compartment alone. I had enough clothes that I only had to do laundry once during my trip. There was still plenty of room left for gifts and souvenirs too. Also, the main compartment opens up like a suitcase, so you can zip it wide open and access anything you've packed quickly. 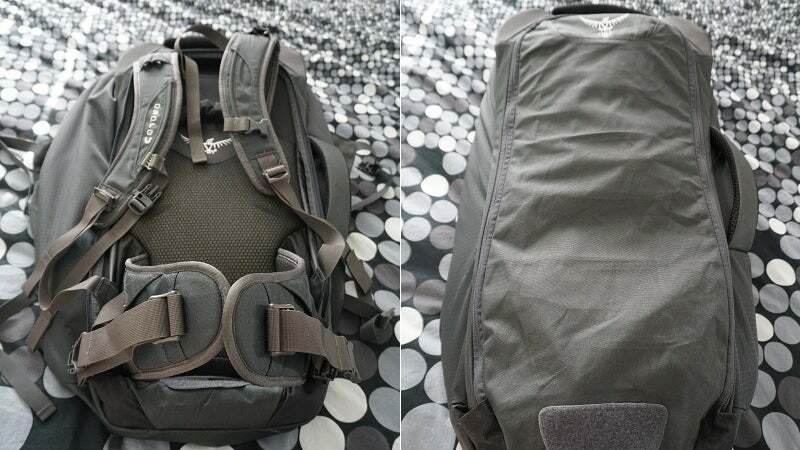 The front part of the backpack - the removable 15L daypack - has enough space for all of my gadgets and other items, like my camera kit, chunky Bose headphones and even a couple of books. There are also dedicated laptop and tablet sleeves. The daypack portion of the bag also has two mesh, stretchy water bottle holders that help you save space inside the bag. And just like the main compartment, I had plenty of room to add things if need be. Both main compartments have lockable zippers too, so you can keep your stuff safe from quick-fingered thieves with TSA-approved locks. The Farpoint 55 has padded shoulder harness straps, adjustable sternum strap (with a built-in safety whistle) and a padded hip belt. Putting the pack on feels like you're strapping on a jetpack, but it's so comfy you don't really notice it, even when you're close to maximum weight. 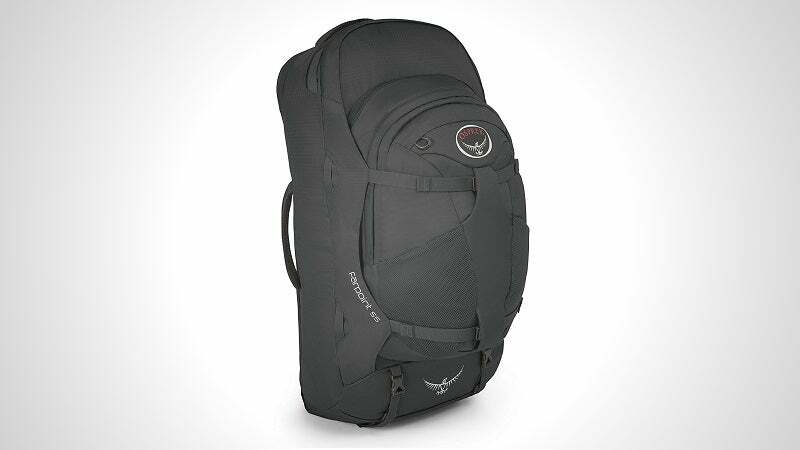 That's because the pack has a peripheral frame suspension system that you would usually only find on a dedicated trekking backpack. It transfers weight from the shoulder harness straps to your hip belt to save your back some grief. The shoulder harness straps and hip belt also have thick foam padding that keep the straps from rubbing or digging into your shoulders and waist. And compression straps around the bag stabilise the bag contents so nothing bounces around when you move. When I have this thing on, it feels like it's part of me, not something I'm lugging around. I could easily break out into a full sprint if I was about to miss a train and not feel too bogged down. Best of all, you can stow the shoulder harness straps and hip belt if you want the bag to be a bit more compact and snag-proof. You just roll out the cover from the bottom of the bag and zip it up over the straps. 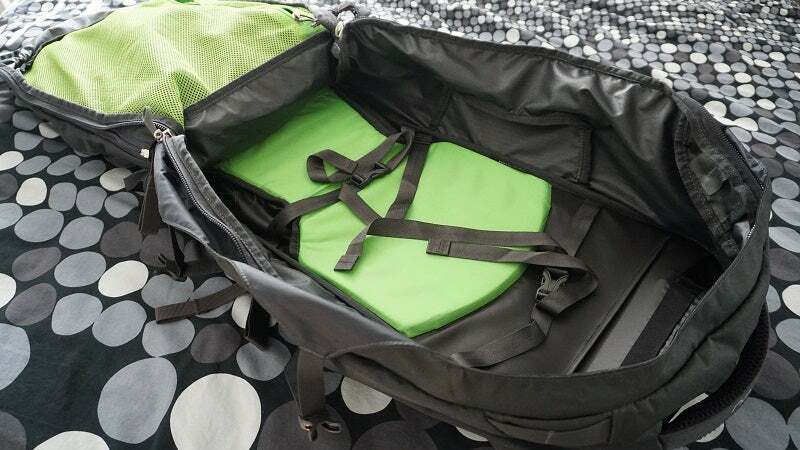 The pack also has padded handles on the top and side so you can handle it more like a soft suitcase if you want. My favourite thing about the Farpoint 55 is the removable daypack. 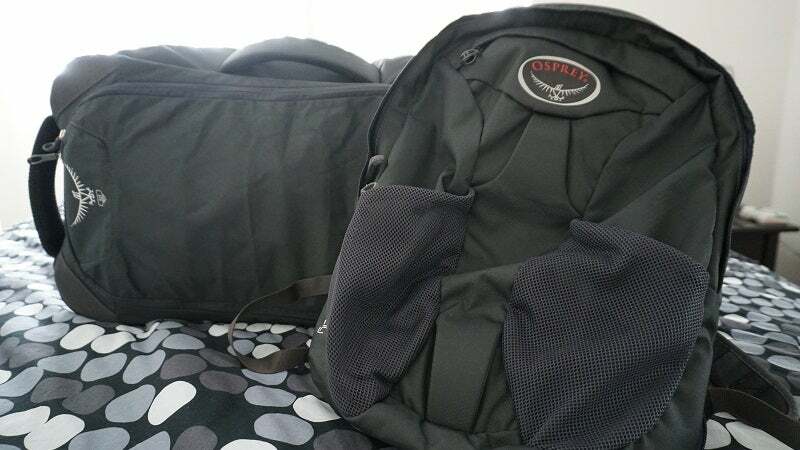 Once I was checked in at a hotel (or capsule hotel), I could unzip the daypack from the rest of the bag, swap some gear around and travel much lighter. The back and straps of the daypack are lined with the same mesh and foam as the main pack, and there's an adjustable sternum strap to help keep you comfortable. The front of the daypack has the previously mentioned mesh water bottle holders, as well as a deceptively deep mini-compartment. I only used one of the mesh water bottle holders for a water bottle, but the other one made for a great place to stick garbage when there wasn't a trash can around. And while the front mini-compartment looks like it would only hold a pair of sunglasses from the outside, I was able to carry around snacks, change, maps and a phrasebook in addition to my shades. 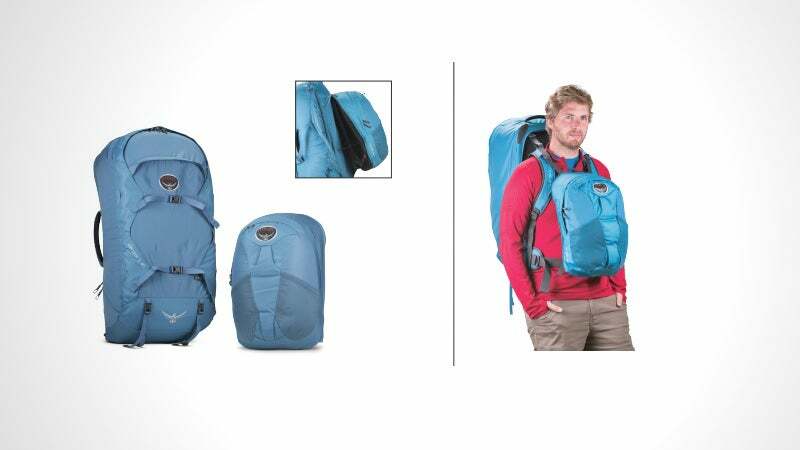 The daypack can also be removed and carried on your chest to help balance things out or protect your valuables. All you have to do is unzip it from the main pack and clip it onto the shoulder straps of the main pack. I never felt the need to do this, but it's nice to know that it's possible. The Farpoint 55 isn't without its own quirks, though. The pack only has three main compartments overall - including the daypack, which has two of them - with a few pockets inside of each. If you're the type that likes to organise things by compartment when you pack, you don't have much to work with. I was able to make things work just fine with some packing cubes, but I still wish all that space was shared among a few more compartments. And none of the Farpoint packs Osprey offers comes with a rain cover. This isn't a deal-breaker, but a lot of other companies build them into their bags or include them with the bag. Osprey's rain covers, while highly rated, are going to cost you another $46 at least. The Farpoint's heavy duty nylon stands up well to light rain and other abuse, though, so it didn't end up being an issue for me. In fact, after the bag getting wet and me tossing it around train stations, parks and hotels for 10 days it still looks brand new. I can't wait to travel with it again.